Martha Berry writes that she does not want her guests to tip the boys & girls because she would like them to treat the guests as if they were in their home. 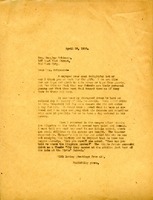 Martha Berry thanks Mrs. Robinson for her letter and her gift, and encourages her to endow a day in honor of Col. Roosevelt. She also tells a funny story about a little boy's history lesson. Myra S. Young says she is mailing a few postcards that she used in her American history classes, because she thinks they may be useful to the elementary history classes at Berry. She also plans to continue sending a few magazine to the school each month. 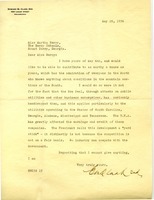 Clark is unable to donate to the Berry Schools because of the New Deal legislation and the effect it has had on utilities and other businesses.